Notwithstanding the recession, it states that projections for 2020 suggest figures could increase to 350,000 workers, 70,000 students and 180,000 residents. This would “put pressure on the public realm”, requiring reallocation of road space. 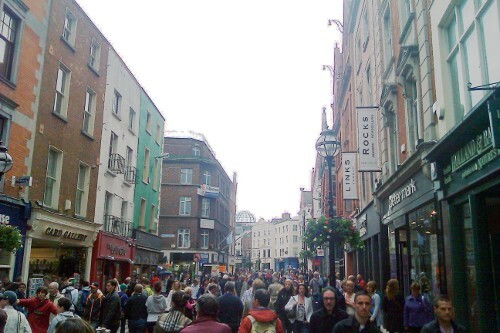 Dublin City Council says it recognises that a “collaborative approach” is needed to “develop a standard of public realm befitting our capital city”. The draft strategy sets out detailed actions to achieve this, in collaboration with other agencies. City manager John Tierney says the purpose of the strategy is not to propose expensive master plans or signature redevelopments for the coming years but is about working to create better ways to carry out the work that goes on each day in the city. Key players carrying out works in public spaces are identified as the city council, transport agencies, utility companies, State agencies and private developers. However, there is “no overarching control mechanism other than a permit system”, the draft states. “Establishing an effective code of practice for doing work and reinstating afterwards would be beneficial . . . it would also reduce waste and costs,” it adds. A need for consistency in materials used is also noted. “There has been a proliferation of street furniture, signage and other forms of street clutter in recent years [which has] negatively affected the accessibility of spaces and their visual quality,” it states. Removing such clutter, where possible, would improve the public realm. Among the proposals listed in the strategy are a pilot project to tackle an unidentified “high-profile dereliction blackspot in the city centre”, develop designs to upgrade Grafton Street, College Green and a “project” to improve the Liffey quays. The draft concedes that funding for public realm improvements, or even maintenance, “is an issue in the current economic environment, and new methods of funding need to be found” – by encouraging the private sector to manage public areas.